The signs pointed towards Gräfenburg, a place I know fairly well. 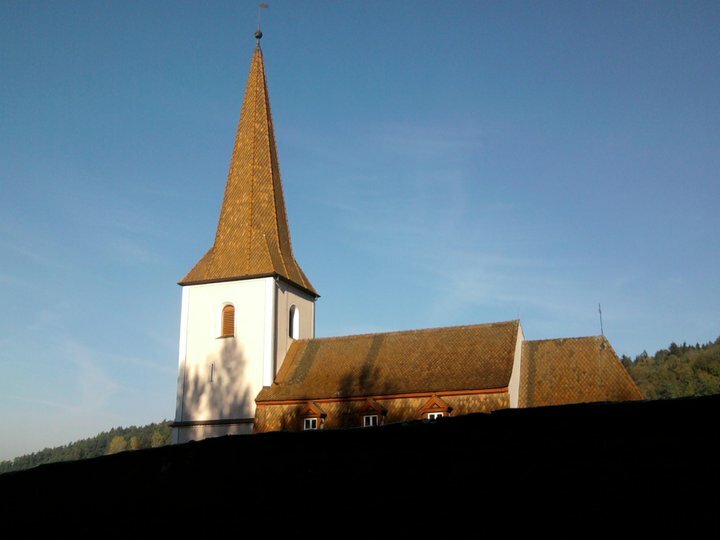 A lovely little village not far from our home here in Kleinsendelbach, Gräfenburg is the gateway to the "Franconian Switzerland" and, as such, has played a very important role in this region's history. Well known for its breweries, many of Gräfenburg's old half-timber buildings lean precariously into its uneven cobblestone streets, and the few that don't boast traditional handpainted Bavarian murals on their sides. But as I drove down the winding street, which then merged into the next, beautiful Gräfenburg was altogether dismissed. I ached to explore something new. All at once, the road forked. Most cars veered to the right. Only a small yellow sign pointed towards the left, towards the village of Affalterbach. I head never heard of Affalterbach, though it was only minutes from my house. Perfect. Left we went. 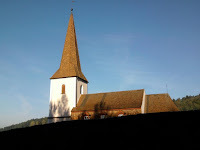 Affalterbach was small, and before we knew it, we were in Stöckach, with its proud "St. Ägidius" Church tower, following signs towards the arterial B2. 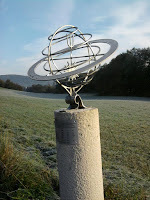 At the edge of the small town of Stöckach appeared a curve in the road and, with it, a sign for the "Sonnen- und Planetenweg". Now things were starting to get interesting. Suddenly metal sculptures of Uranus and Neptune appeared seemingly out of nowhere, adorning soft green fields of frost, and causing one to stop and take in the view of the valley and surrounding hills, dotted with shades of red and brown. 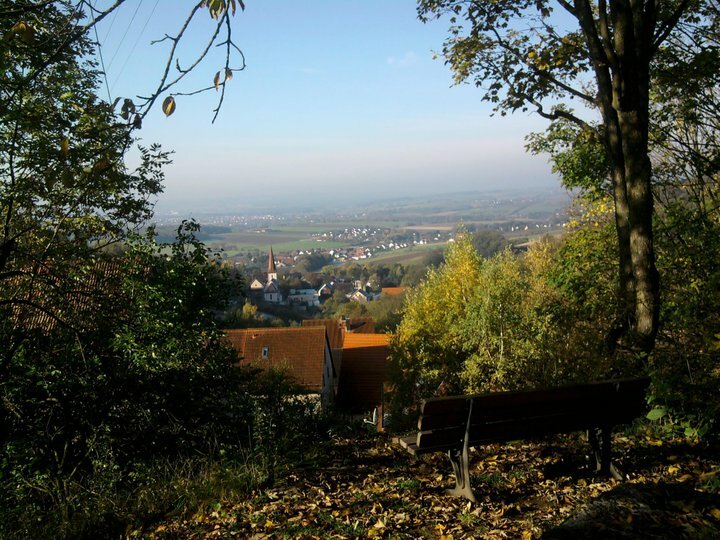 The beauty of the sculptures, though no match for the stunning panorama, provided passersby with an excuse to stop and admire the view, spread softly like watercolor brushstrokes on the broad canvas of the Franconian countryside. 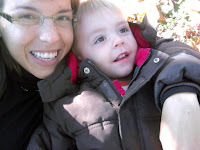 As my two-year-old recently began to say, "wunderschön"! Once we reached the B2, we had to decide whether to go left, towards Gräfenburg, or right, towards Eckental. We chose left, but then immediately took a right turn, our (okay, my) curiousity caught by the sign "1000 Jahren Rüsselbach". I had never heard of it, and it was a thousand years old. How much better could it get? 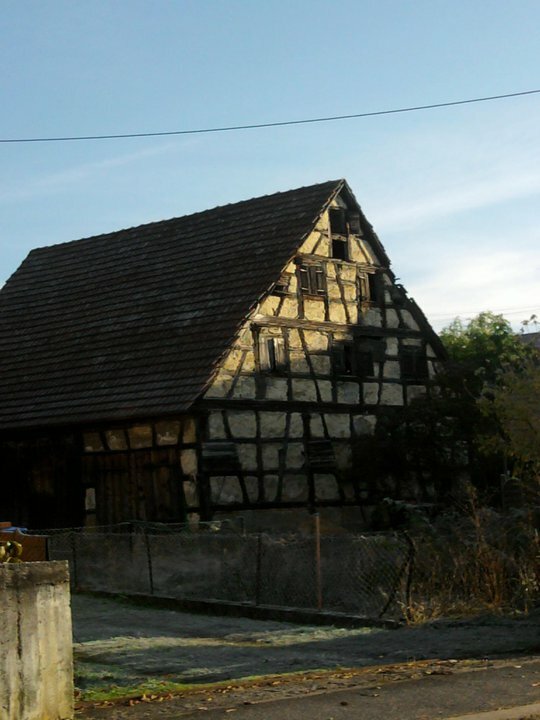 We moseyed through Unterüsselbach, with it's crumbling old half-timber barn, likely as old as the Rüsselbachs themselves, then onto Mittel- and Kirchrüsselbach (this is where the Rüsselbachs go to church... imagine walking a kilometer or two up a steep hill to get to church every week! ), rounding one final corner to reach the top of the hill in Oberüsselbach. With its hiking trails, spring fed creek, sprawling solar-energy farm, and panorama view-picnic spot, Oberüsselbach was quite literally the icing on the cake. A day later I returned to hike to the Spring with the whole family. It was a slightly risky hike, with wobbly stones and lots of slippery Autumn foliage covering the trail, but at its end were the ruins of a teensy half-timber forest cottage. It's roof was caving in, and cobwebs covered the four-paned window. How fun to stumble upon this little fading gem! As we returned to the car clouds started to gather. Our timing couldn't have been better. I could have just as well spent the morning at the mall, sipping on Starbucks. But this little adventure, it was priceless. And an important part of me was brought back to life. Welcome back, spontaneous adventures. I hope you're here to stay.